Edgewater "Third Saturdays" Reviewed by Edgeville Buzz on June 5, 2009 . Set for June 20, July 18, and August 15 from 10AM–6PM. Free trolley, music, street performances, and sidewalk sales from Edgewater businesses. Edgewater, Chicago, IL June 5, 2009 – The Edgewater Chamber of Commerce, in conjunction with Special Service Area #26, the Edgewater Community Council, the Edgewater Development Corporation, and Aldermanic Office of the 48th Ward, launches Third Saturdays on June 20, 2009. Third Saturdays is a summer Saturday series featuring a free trolley, music, and street entertainment. Created to promote a greater sense of walkablity of the area and invigorate the community’s economy, the event series will take place on the third Saturday of June, July, and August 2009, from 10AM to 6PM. 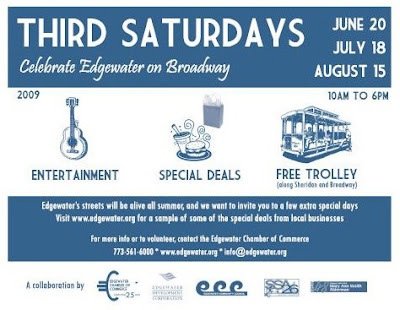 On these special Saturdays, Edgewater businesses along Broadway will feature sidewalk sales, deals, promotions, and fun. Residents will enjoy free trolley service along Sheridan and Broadway during the event and the chance to walk and explore Edgewater. Broadway will be alive with Parisian-style street performers, artists, and musicians; with some music and entertainment focused in designated areas. June 20 features music around Granville and Thorndale at Broadway. July 18 features entertainment around Berwyn and on August 15, the entertainment will be focused on Bryn Mawr. For additional information on the news that is the subject of this release contact Libby Alexander or regularly visit www.edgewater.org for more information and a growing list of participating businesses and sales. Edgewater Chamber of Commerce is a non-profit organization committed to creating and supporting a thriving business environment, contributing to a vibrant Edgewater community. Visit www.edgewater.org for more information.